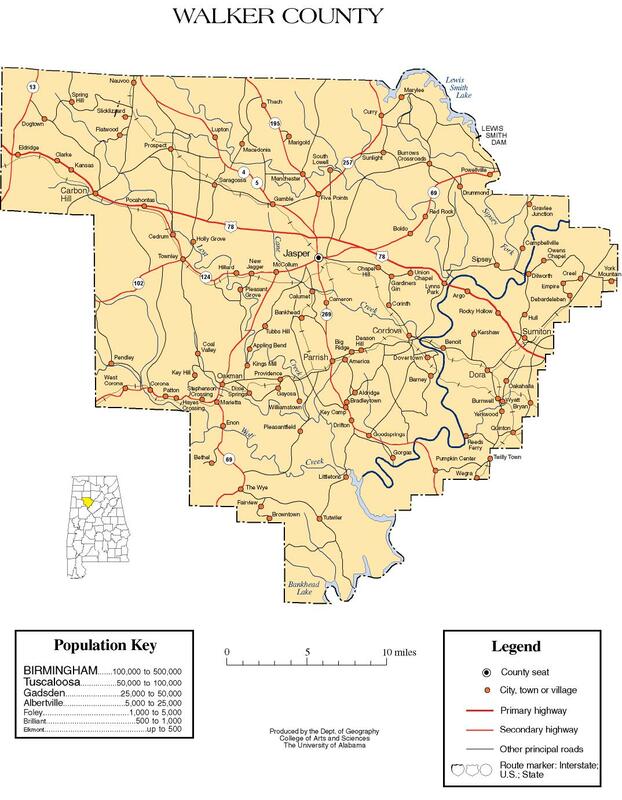 Walker County is included in the Birmingham-Hoover, AL Metropolitan Statistical Area. Walker County has sites listed on the National Register of Historic Places. They include the Bankhead House, Boshell's Mill, the First United Methodist Church of Jasper, the Gilchrist House, the Jasper Downtown Historic District, the Stephenson House, and Walker County Hospital. According to the U.S. Census Bureau, the county has a total area of 805 square miles (2,080 km2), of which 791 square miles (2,050 km2) is land and 14 square miles (36 km2) (1.7%) is water. As of the census of 2000, there were 70,713 people, 28,364 households, and 20,478 families residing in the county. The population density was 89 people per square mile (34/km2). There were 32,417 housing units at an average density of 41 per square mile (16/km2). The racial makeup of the county was 92.15% White, 6.17% Black or African American, 0.28% Native American, 0.20% Asian, 0.02% Pacific Islander, 0.31% from other races, and 0.86% from two or more races. Nearly 0.86% of the population were Hispanic or Latino of any race. There were 28,364 households, out of which 30.70% had children under the age of 18 living with them; 56.30% were married couples living together, 11.90% had a female householder with no husband present, and 27.80% were non-families. 25.30% of all households were made up of individuals, and 11.20% had someone living alone who was 65 years of age or older. The average household size was 2.46, and the average family size was 2.93. In the county, the population was spread out with 23.50% under the age of 18, 8.60% from 18 to 24, 28.00% from 25 to 44, 25.10% from 45 to 64, and 14.80% who were 65 years of age or older. The median age was 38 years. For every 100 females, there were 93.20 males. For every 100 females age 18 and over, there were 89.80 males. The median income for a household in the county was $29,076, and the median income for a family was $35,221. Males had a median income of $31,242 versus $20,089 for females. The per capita income for the county was $15,546. About 13.20% of families and 16.50% of the population were below the poverty line, including 21.00% of those under age 18 and 17.40% of those age 65 or over. As of the census of 2010, there were 67,023 people, 26,571 households, and 18,741 families residing in the county. The population density was 85 people per square mile (33/km2). There were 30,816 housing units at an average density of 38 per square mile (15/km2). The racial makeup of the county was 91.2% White, 5.9% Black or African American, 0.4% Native American, 0.3% Asian, 0.1% Pacific Islander, 1.0% from other races, and 1.2% from two or more races. Nearly 2.0% of the population were Hispanic or Latino of any race. There were 26,571 households, out of which 26.8% had children under the age of 18 living with them; 52.0% were married couples living together, 13.3% had a female householder with no husband present, and 29.5% were non-families. 25.8% of all households were made up of individuals, and 11.2% had someone living alone who was 65 years of age or older. The average household size was 2.49, and the average family size was 2.97. In the county, the population was spread out with 22.5% under the age of 18, 8.1% from 18 to 24, 24.4% from 25 to 44, 28.7% from 45 to 64, and 16.3% who were 65 years of age or older. The median age was 41.2 years. For every 100 females, there were 95.1 males. For every 100 females age 18 and over, there were 97.8 males. The median income for a household in the county was $37,191, and the median income for a family was $45,788. Males had a median income of $43,671 versus $27,662 for females. The per capita income for the county was $20,516. About 14.7% of families and 18.6% of the population were below the poverty line, including 27.5% of those under age 18 and 12.4% of those age 65 or over. Walker County is home to the William B. Bankhead National Forest and Lewis Smith Lake, in addition to the Alabama Mining Museum. ^ a b c d e f "ACES Walker County Office" (links/history), Alabama Cooperative Extension System (ACES), 2007, webpage: ACES-Walker. ^ "American FactFinder". United States Census Bureau. Retrieved 2015-08-13. Walker County map of roads/towns (map © 2007 Univ. of Alabama). This page was last edited on 4 August 2018, at 04:25 (UTC).